LOL’ No, they are not in Lima, but I have just gotten my Yesasia order, which rocks my world!!! It was relatively fast, as it only took 11 days… when Amazon.com usually takes 2 weeks or a month! It didn’t use to be like that, Amazon.com used to be prompt in orders, sometimes getting my stuff in a couple of days, instead of a couple of weeks. Even worse, Amazon has increased its shipping cost……….. when Yesasia offers free international shipping~~~~ So if you’re buying Asian music or films, don’t hesitate and buy Yesasia! As the weird obsessive fan that I am, you might not find my dying for these cups weird. Anyone watching the show must have noticed and over-analyzed the meaning of the cups… so INSTANT LOVE! 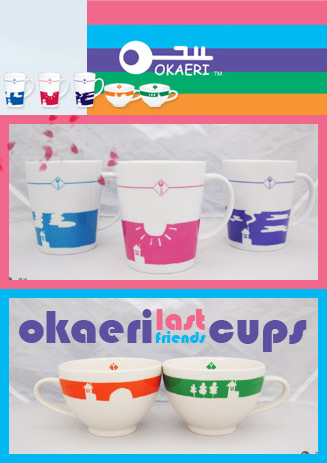 For those who don’t know, Okaeri Cups or the Welcome Home Cups are heavily featured on one of Japan’s favorite dramas of the season, Last Friends. You can find the cups at the FujiTV shop Online. Prices on US$ are roughly, $15 USD for the Tall Cups (that belong to Ruka/Michiru/Takeru), and $18 USD for the Latte Cups (that belong to Eri and Ogurin). Pricey! ain’t it? ?